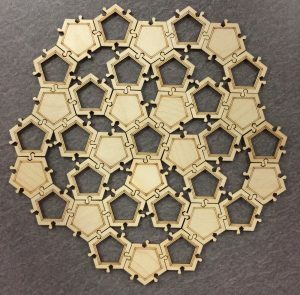 The Koch snowflake got me thinking about producing other sets of tiles that can be used to tesselate the plane. 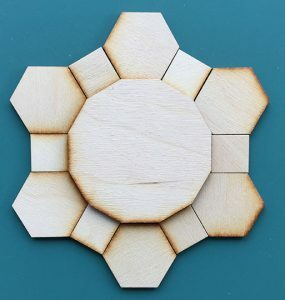 For the classroom, I created a prototype set of regular polygon tiles, which I used in conjunction with Jacobs’ Mathematics: A Human Endeavor. 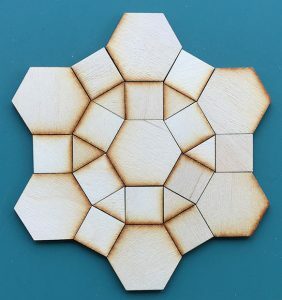 These happened to be created on a laser with lower power and airflow than mine, so some of the tiles have caramel-colored edges, which I clean up in production. But I kind of like the way it highlights the edges. 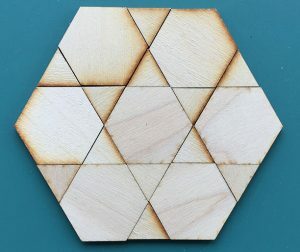 Regular tilings of the plane used only regular polygons to completely fill the plane, and this can only be done with triangles, squares, and hexagons. 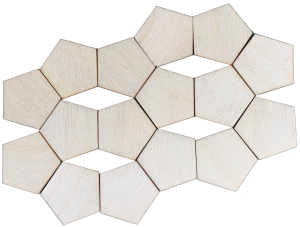 However, there are many more semi-regular tilings, which allow 2 or more polygon types, always meeting in the same way at the corners. 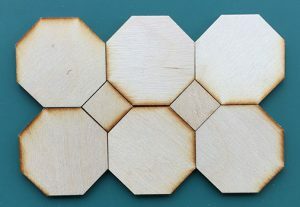 Below are the 3.6.3.6 and 3.4.6.4 tilings, named for the number of sides of the polygons that meet at each vertex in the tiling. As we played with them, we found it a little frustrating that a slight bump tends to move everything out of alignment. So I added tabs. The construction below comes up often in graphics of Kepler’s work.